Shared services are where internal services, that exist in multiple parts of the same organisation, or across a partner network, are combined into a single consolidated service, delivered by a single part of the organisation, or network, to achieve collaborative advantage. Services are shared for a wide range of stated reasons and perceived benefits (direct and indirect), but the main underlying drivers are typically to reduce costs through economies of scale; and to achieve operational efficiencies by standardising practices across the different parts of the organisation, or network. Shared services are frequently confused with outsourcing; and the terms are frequently used interchangably. But outsourcing is a separate and distinct form of delivery model. Within the private sector, shared services are mainly associated with large corporations and multi-nationals, where corporate (also referred to as support or back office) services, such as finance, Human Resource Management and Information Technology, are consolidated across operating divisions, often into free-standing Shared Service Centres (SSCs). Core (end-customer) services may also be shared. Common elements of the core service are combined and then delivered as a shared service. Call Centres are an example of this. In the public sector, the use of shared services is less well established, but Governments have become increasingly keen on the idea over the last 10 years or so. In the UK, the sharing of corporate services are now effectively mandated for central government departments. It is rare for an entire service to be shared. Often, strategic, mission critical or more complex aspects of the service are retained within the individual business unit. Shared Services Centres (SSC) are increasingly being run as stand-alone business divisions, supplying to the internal market and sometimes beyond; and competing with external Business Process Outsourcing (BPO) providers. There are even cases where the SSC is sold off and then supplies back into the organisation, as an external supplier. This is the main justification for the sharing of services. Economies of scale can be achieved by sharing the fixed costs of the service, e.g. buildings and IT. These are reduced by eliminating duplication and sharing the investment in, maintenance of; and refresh of a common, shared infrastructure. In the case of small operating divisions or organisations, variable costs may also be reduced, due to improved resource utilisation and greater buying power. But this is unlikely to be a major factor for larger organisations – all other things being equal, e.g. wages and staff terms and conditions. Economies of scale can also come through improved access to capabilities, not present in the individual organisations themselves, e.g. service expertise and/or access to new technology. As ever with these things, there is a flip side to the economies of scale. The bigger something is, the harder it is to manage and the less responsive it may be. 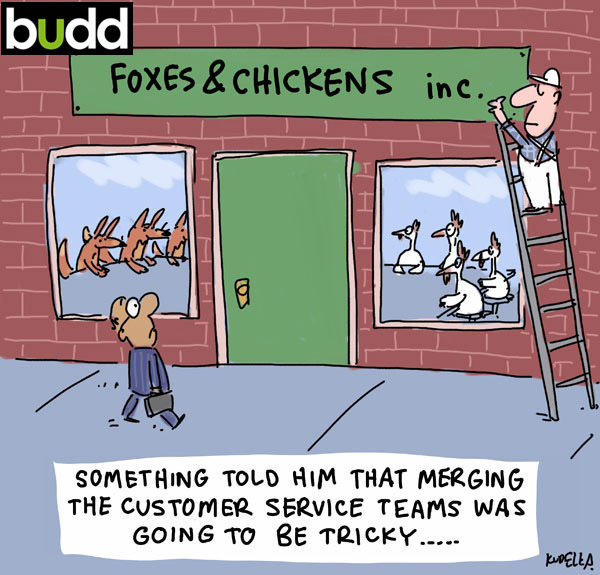 The benefits of a shared service can be outweighed by the downside of creating a lack of connection with the business activities, that the shared service is there to support. For his different purposes man needs many different structures, both small ones and large ones, some exclusive and some comprehensive….what is needed in all these matters is to discriminate…For every activity there is a certain appropriate scale…What scale is appropriate? It depends on what we are trying to do. Ultimately, the sharing of services with other organisations is a design judgement to be made, based on the particular circumstances of the business – it is not something that can be prescribed. ‘EasyShare’. The shared service is implemented around a shrinked-wrapped offering – pre-specified, standardised infrastructure and services. This takes little account of the variation in demand within and across the participating organisations. This is the budget airlines approach to shared services. What’s right for us, is right for everyone else. Organisation ‘A’ re-designs a service, with the view to then offering it as a shared service to others. Although the service is right for them, it does not take into account the nature of the demand for the other organisations. Worse, if the re-design has been poorly executed, then the service will still have significant losses, or waste, in the system, associated with organisation ‘A’. For the other organisations, the negative impact of this waste is likely to be multiplied. Single, cost perspective. The shared service is designed purely around unit costs, at the expense of service quality, i.e. delivering the customer’s nominal value. Unit costs are minimised, but total costs increase due to poor service quality and increased failure demand. In all these examples, cost is effectively transferred across to the participating organisations, through the sub-optimisation of their businesses, by using the shared service. Viewed in isolation, the performance of the shared service may be seen to have improved, but this is a classic case of the ‘optimisation’ of part of a system, at the expense of the system as a whole. As for any service, the golden rule for implementing a shared service is to design the service within the context of the overall system to which it forms a part. In creating a shared service, the boundaries of this system need to incorporate all the participating organisations. As discussed under Systems Thinking, the objective is to optimise the system as a whole, not the individual parts. The ability to collaborate is essential for a shared service to work. If the participating organisations do not have a deep culture of collaboration, it is unlikely that a shared service will prove successful. Given that this lack of collaborative capability will almost certainly be impacting other areas of the business, addressing this issue first should be the priority, not the sharing of services. The next essential is for the nature of demand across the participating organisations to be similar, both in terms of infrastructure and delivered services. Just because every organisation has a Human Resources department, does not mean that the needs for that service are the same. The organisation’s values, polices, procedures and behaviours need to be similar for this to be the case. Assuming there is a strong collaborative capability and a good alignment of demand, the next, more detailed essential, is to design the shared service around those elements of the demand that are common, whilst accomodating those elements that need to be different, e.g. due to the nature of business, geography, demographics, culture (both internal and external), language, legislative rules, etc. This is a process of normalisation, or same with difference. A final key essential is appropriate Governance. By its very nature, a shared service is a federal entity – created and run for the benefit of all, not for any one participating organisation, or the corporate centre. It is essential that a shared service is run independently of the participating organisations, but under their collective governance. There has to be a strong element of federalised control and ownership over the service being delivered. 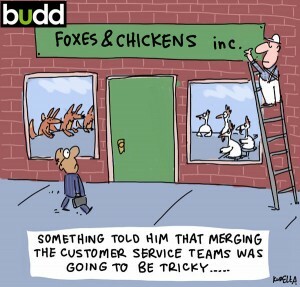 If a shared service beats to its own drum, then it is no longer a shared service. It is simply a service being supplied by an external supplier, to a number of organisations, who just happen to be related. You might consider this a bit left-of-field. But in terms of fueling your thoughts and ideas about service design, definitely one to read. It might also change your outlook on life more generally. It did mine. My blog post, on the use of shared services in the public sector, published in October 2012.